I was asked if I would like to review the new edition of the RHS A-Z Encyclopedia of Garden Plants and I immediately said yes. 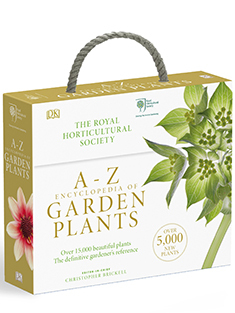 I had two very definite reasons for this: firstly, I have a couple of the RHS encyclopedias and they are as detailed and informative as you would expect and secondly, well, to be frank, it is an expensive book and I am not sure I would have ever bought it for myself. Hold this thought, I will return to it. It is a beast of a book, it is quite heavy and probably not a book to take on a plane journey that is for sure. It comes in a rather natty carry case with a rope handle. It needs the rope handle, did I mention it was heavy? This is the fourth edition of this book and it is 1119 pages of fantastic content. 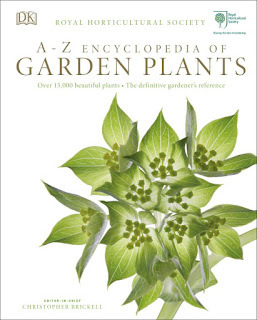 The blurb I was sent with the book tells me that it covers 15,000 plants and so covers more garden plants than any other illustrated book or website. Impressive stuff. The book (thankfully) starts by telling you how to use it. There is so much information about each plant that it is very useful that the book tells you what it is telling you. 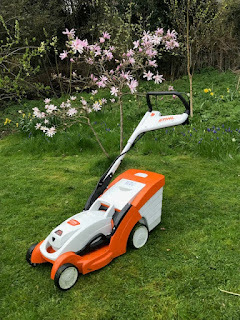 It then briefly and concisely talks you through what you need to know about hardyness and the different H zones that are frequently referred to in plants guides and labels. Then you are walked (trotted) through amongst other things how to cultivate under glass, propagation, pruning and different flower types. It is all very clearly laid out though I am going to mention that the typeface is fairly small and the pages are quite dense with text. If you are getting to that stage with your eyesight that I am now at, you need a good light to read it with. There are thirty pages before you get to the first plant in the encyclopedia and I was already thinking what a great book this is. Now of course I have not yet read every page, that is not what an encyclopedia is for. This book is for dipping into. 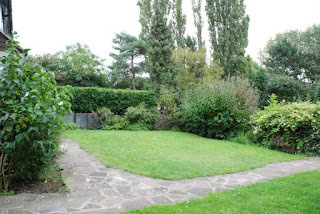 I have a couple of problem shrubs in the garden at the moment that are not performing as I would like, so I started by looking them up to check whether I had provided the right conditions for them. But then one things leads to another. Whilst looking up Pinus mugo suddenly I am looking at Pinus sylvestris 'Golden Coin' and making that 'mmm' noise to myself. A moment later the pages have flipped over a bit and I am studying Disanthus cercidifolius and thinking Hmm H5 and nipping back in the book to the H zone information and considering adding the shrub to the list of plants to keep an eye out for. Now some of you will be reading this and thinking 'isn't this all what the internet is for?' well, dear reader, yes and I am generally one of those people. An internet search engine is a great thing and most things can be found and here is where I come back to where I started this review; bear with me. My "bible" is the RHS new Encyclopedia of Plants and Flowers, which I see is a 1999 edition - and it cost £35, so I think that, too, was probably a gift! Christmas is coming, but this time I have already decided on Plant: Exploring the Botanical World. Thanks - I looked up that book, it looks amazing too. How useful would the book be for someone outside the UK, living and gardening in a much colder climate? It does cover plants from most of the H zones but I think it's fair to say it's designed for the UK climate mainly. It depends how different a climate it is. This looks like a most fascinating tome Alison but I think that I will stick with my earlier edition even though it will now be outdated. My only reservation is the weight. I just wonder why they could not have split it over two volumes.